Eurofins Pharma Bioanalytical Services functions in tandem with our large molecule clients worldwide to provide the expertise and experience required in conducting and reporting new drug clinical study results to regulatory agencies. 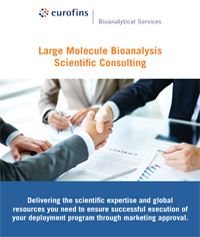 Our team offers a wide range of consulting services in support of proposed and ongoing large molecule bioanalysis. Our key strength is our technical expertise, particularly in the large molecule GLP testing space, extending across a diverse type of analytical platforms. Our capabilities are also supported by our quality and regulatory expertise with over 15 years of experience in this specific area of testing services. We are dedicated to meet the needs of customers with an emphasis on the design of large molecule bioanalytical programs. With our extensive scientific, technical and regulatory expertise in conducting studies in both the US and EU, coupled with our global presence; our consulting team is uniquely qualified to provide clients with the reliability they can trust.